In theory, workers in China are promised security through official trade union representation and the rule of the Communist Party. In practice, confronted with the endless churning of a globalised labour market, they are increasingly voting with their feet. I'll Be Militant: the IBM workers on strike in Shenzhen. Image / China Labour Bulletin. All rights reserved.The ten-day strike by more than a thousand workers at an IBM factory in the southern Chinese city of Shenzhen in early March grabbed international media attention. Yet there was nothing particularly unusual about the strike—it was, in many ways, a microcosm of the shifting dynamics of labour relations in China today. One of the primary causes of unrest over the last three years has been the sale, merger, relocation or closure of factories in the manufacturing heartland of southern China. The Shenzhen strike was triggered by IBM’s sale of its low-end server business to the Chinese-owned computer manufacturer Lenovo and the workers’ protest followed a familiar pattern. The workers knew ahead of time that they might have to fight for decent compensation from IBM and were ready to take action when the company made its “take it or leave it” offer. From March 3rd to 12th, the workers staged regular protests, marching around the compound, banging drums and gongs, demanding double what IBM was offering. They made sure they did nothing to antagonise the local authorities or the police—indeed, the local government attempted to mediate on the workers’ behalf. The protest highlighted the ambiguous role of the official trade union and the importance of local non-governmental organisations that actively look out for the rights and interests of workers. The workers’ general assessment of the IBM factory trade union was: “The union exists in name only. It's useless.” But the municipal trade union in Shenzhen has in the last few years positioned itself as a defender of workers’ rights and did eventually take a stand when 20 of the striking workers were sacked by IBM. At the same time, two labour-rights groups in the city had been talking to the workers about electing worker representatives to directly negotiate with management but the resolve of the workers weakened after the strike leaders were sacked and most eventually accepted IBM’s offer. Although the IBM workers’ action failed to get the desired result, the workers still came away with something—both those employees who agreed to move over to Lenovo and those who decided to leave the factory and look for another job elsewhere. And perhaps the only reason IBM made a compensation offer at all was that management knew, from the numerous strikes and protests over the same issue in Shenzhen and across China, that it would face even more trouble if it did not. The workers’ demands, in and of themselves, are not a threat to the party. In May 2013, several hundred workers at the Hong Kong-owned furniture maker Diweixin had marched through Shenzhen after management refused to discuss compensation when the factory relocated to neighbouring Huizhou. The workers clashed with police and more than 200 protesters were detained. One of the strike leaders, a 40-year-old migrant worker, Wu Guijun, was arrested and eventually tried on public-order offences. And in an incident even closer to home, thousands of workers at the Nokia factory in Dongguan staged strikes and sit-ins in November, when management refused to discuss workers’ concerns stemming from the sale of Nokia’s mobile-phone business to Microsoft. Nokia sacked 213 strikers and faces legal action from 70 seeking reinstatement. Employers in China are no longer under any illusion that if they attempt to railroad through a deal with which their employees are not happy the workers will put up a fight. A research report by China Labour Bulletin (CLB) on the workers’ movement recorded 1,171 strikes and worker protests from June 2011 to the end of 2013. And these were just the incidents reported in the Chinese media and social media—the number was certainly much higher. Although factory workers in southern China are probably the most determined in standing up for their rights, they are not alone. The manufacturing sector accounted for 40% of the strikes recorded by CLB but transport workers, mainly taxi and bus drivers, took up another 26%. Construction workers, service providers, teachers and shop workers also staged periodic strikes over low pay, wage arrears and non-payment of employer social-insurance contributions. The vast majority of these strikes were organised by the workers themselves, without the involvement of the trade union. Workers in China are now much more aware of their own collective strength—of their ability to organise and bring their grievances to a wider audience and get the local government involved. They have been aided considerably over the last few years by the rapid development of the social media and messaging platforms Weibo and WeChat, and the widespread availability of cheap, no-brand smartphones. Strike organisers can not only get their colleagues together on social media—they can post updates, photographs and videos on the strike’s progress and the response of management. This social media activism has allowed the mainstream Chinese media to report on the workers’ protests and this, in turn, has put pressure on local-government officials to resolve disputes as quickly as possible. Workers have also been supported in their action by labour-rights groups, especially in the southern province of Guangdong. They are increasingly focused on guiding workers through collective actions and encouraging them to elect representatives and bargain directly with the employer, rather than relying on the local government to come to their aid. These NGOs have amassed considerable experience over the last three years in maintaining worker solidarity and providing expert strategic advice during each stage of the bargaining process. Indeed a number of organisations have produced a Code of Collective Bargaining, based on their experience, which can be used by other workers and NGOs to push for collective bargaining as well as act as a possible template for legislation. In short, China’s labour NGOs have been playing the role the trade union should have played but has thus far failed to do. The official All-China Federation of Trade Unions (ACFTU) has for the most part been unwilling or unable to support China’s workers and help level the playing field in labour relations. The trade union has essentially been a helpless bystander as the workers’ movement has gained momentum. But there are signs that growing pressure from the workers for the union to represent their interests better is beginning to take effect. At the same time as the IBM strike in Shenzhen, workers at Pepsi plants in several cities across China went out in a co-ordinated strike against large-scale layoffs, pay cuts and reduced benefits. The protests were backed and even led by the company trade union and several individual factory unions. 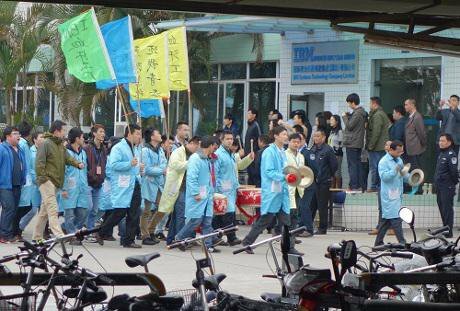 And in the central province of Hunan the trade union at a Walmart store, which was scheduled to close on March 19th, took the lead in protests by nearly 150 shop workers opposed to the planned closure. Why would an authoritarian regime like the Chinese Communist Party tolerate such an active and seemingly radicalised workforce, especially when it is being supported in some cases by the trade union? The workers’ demands, in and of themselves, are not a threat to the party. Quite the contrary: demands for better pay and conditions and for pension payments and decent severance pay after years, even decades, of service are perfectly in keeping with the party’s stated desire to raise the incomes of ordinary workers, reduce the rapidly growing gap between rich and poor and create a new class of consumers that can put the Chinese economy on a more stable and sustainable footing. The authorities are more concerned about the means used to pursue those demands. If protests do get out of hand and workers start blocking traffic and destroying property, the police will certainly move in and make arrests. Over the two and a half years covered by CLB’s report, police intervened in about 20% of strikes and protests, with a noticeable increase in the latter half of 2013. In many cases, the intervention was simply to contain the situation, although it was not unusual for minor conflicts to ensue. In October, the party general secretary, Xi Jinping, summoned the new leadership of the ACFTU to party headquarters in Beijing and explained that it was the job of the trade union to help China’s workers realise their dreams. Assisting workers in their disputes with employers determined to suppress wages and cheat them out of their entitlements is clearly one very effective way of helping workers realise their dreams. But despite some encouraging signs the ACFTU as a whole remains inert and stuck in its bureaucratic ways. Most workers will for the time being still have to rely on their own resources and the help of labour NGOs to push the movement forward. Eventually, however, the sheer momentum of the workers’ movement in China may well force the trade union to get on board.